The elements of NSArray and NSDictionary objects can now be inspected in the Xcode debugger. Yes, that’s right folks. You can now view the contents of arrays in the debugger. Some of you may have noticed that the flow of posts (and apps) has slowed down a bit. That’s because, among other things, I’ve been busy working on a little side project. I am extremely happy to announce that that side project is now ready for public consumption, so go check it out at http://surveylitics.com! 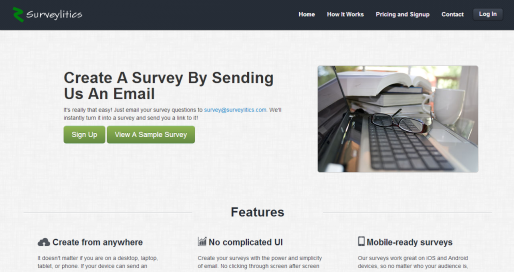 Surveylitics is a SaaS app for creating online surveys. It’s main selling point is the ability to create surveys via email. Feel free to try it out and send along your thoughts – feedback is always appreciated. Now that the Surveylitics launch is out of the way, I’ll hopefully be able to spend a bit more time on the iOS side of things. I’ve already got a nifty new app in the works, and a few other ideas in the pipeline.